Toy horses are a great gift for any hrose lover! They come in different sizes and colors. You can find many acsecories to go with your horse. From saddles, bridles, feed, barns and even a rider! Toy horses allow young kids to simulate what it would be like to have their own horse farm without all the work and mess of a real horse. There are many different brands of horses avalible such as Breyer Horses and Paradise Horses. 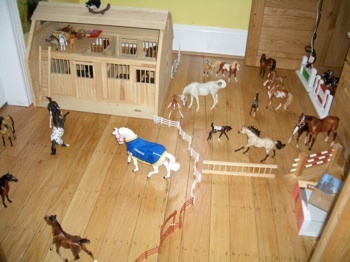 A toy horse barn set up. 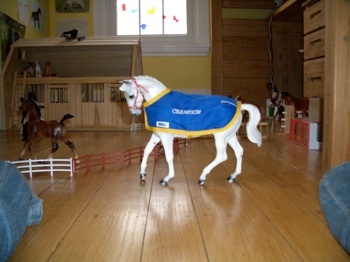 Here is a toy horse from Breyer Horses, its accseseries include a blanket and halter.